Maarten Ten Holter from Vripack Brokers tells me that Griffioen, joint listed with Camper & Nicholsons, has been reduced in price by €300,000. 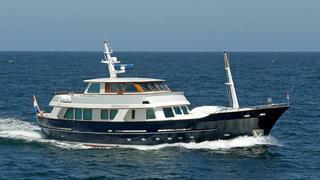 The 27.22m motor yacht is now asking €4,950,000, VAT paid. Built in 2006, this displacement yacht is made for long distance cruising, with carbon folding masts that allow her to pass under bridges on inland waterways. Griffioen was designed by Willem de Vries Lentsch and her Dutch builders Bloemsma & Van Breemen used all-aluminium construction for a durable, versatile motor yacht. With interior design by Felix Buytendijk, she sleeps six in three cabins, with accommodation for four crew. Griffioen has a single Kelvin engine coupled to a Hundested controllable pitch propeller to increase efficiency. This mechanical engine is free of the electronic problems commonly found in other systems, and she also benefits from bow and stern thrusters and zero-speed stabilisers. Her technical specifications enable a Trans-Pacific range of 5,500 nautical miles. Griffioen is for sale with Vripack Brokers and Camper & Nicholsons.